While Favre and Gold have been getting the lion’s share of headlines, both of their “upstarts” have been quietly outperforming. Will this trend continue? 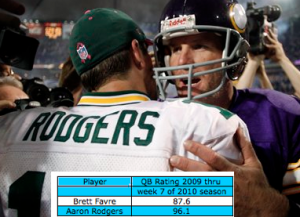 Are Favre and Gold heading towards second tier status? Let’s review each situation. In 2010 investors continued to pile into Gold for inflation, deflation and currency devaluation concerns. (basically any concern worked in Gold’s favor…) It seemed as though Gold could do nothing wrong as it chugged along to all time highs in early October. Since about the third week in October however Gold has corrected, falling from all time highs on concern over weakening China led demand and a stronger dollar. Competing for investor attention in the precious metals arena is Silver. It also corrected with Gold but has rebounded more sharply than its yellow competition. Oddly enough, even though Gold is everywhere and universally touted, Silver has outperformed Gold this year by a mile. SLV, the iShares Silver ETF has gained 40% ytd vs. GLD, the SPDR Gold ETF, with a 24% move upward. In fact looking back over the last 2 years SLV has racked up a 160% gain versus GLD at just under 80%! To be fair Silver, often referred to as the poor man’s gold, is under assault by some who believe its price is being manipulated. In addition some believe that Silver’s abundance versus Gold and heavy industrial use make it a much less stable asset than Gold and one that should trade at a ratio far less than the current roughly 55 to 1 ratio. So while Gold has been outperformed in recent years by Silver, one should be cautious about performance chasing in an area with considerable cloudiness. In my view, Gold would be a significantly more stable allocation than Silver going forward. So there you have it, Rodgers over Favre for now (may be a break out…) but Gold over Silver is my future outlook for these areas. Look for many more twists and turns in the story of Favre and Gold in the coming months. The drama will be sure to continue.